Ann Borden was born on May 9, 1747, at Middleton, Monmouth County, New Jersey. She was the daughter of Colonel Joseph and Elizabeth Rogers Borden, members of a well-to-do family who had founded Bordentown, New Jersey. Ann and her older sister Mary were said to be the handsomest girls in New Jersey. Joseph Borden had a line of stage coaches and boats traveling between New York and Philadelphia. Francis Hopkinson, the son of Thomas Hopkinson and Mary Johnson Hopkinson, was born on October 2, 1737, in Philadelphia, Pennsylvania. Thomas’s early death in 1751 left his wife to care for the children, the oldest of whom, Francis, had just turned fourteen. Mrs. Hopkinson was a lady of superior intellect and well qualified to supervise the education of her children. She had early on recognized indications of genius in her son Francis and made every effort, despite her limited income, to give him the advantages of a superior education. 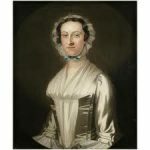 Mary Hopkinson also had help from her husband’s friend, Benjamin Franklin, who saw Francis through the College of Philadelphia, where he received a Bachelor of Arts Degree on May 17, 1757, and a master’s degree in 1760. His mother lived to see him graduate and become an eminent lawyer. Hopkinson studied law in the office of Benjamin Chew, the Attorney General of Pennsylvania. Hopkinson became an attorney in 1761, and set up his practice in Philadelphia. But his was not a career restricted to law and politics. He cultivated an appreciation for music, writing, heraldry, and art. When not working, he spent much of his spare time in service to the Philadelphia Library, as secretary from 1759 through 1766. In early December 1765, Hopkinson was debating a trip to England, and he wrote to Benjamin Franklin: “I have finished the Translation of the Psalms of David, to the great Satisfaction of the Dutch Congregation at New York, & they have paid me £145 their Currency, which I intend to keep as a Body Reserve in Case I should go to England.” Finally, on May 22, 1766, he sailed aboard the Hayfield, a ship owned by Redmond Conyngham, a friend of the family. Hopkinson spent from May 1766 to August 1767 in England in hopes of becoming commissioner of customs for North America. Although unsuccessful, he spent time with the future Prime Minister Lord North and his half-brother, the Bishop of Worcester Brownlow North, and painter Benjamin West. On October 23, 1767, as he had left, so he returned. He still lived with his mother, and had yet to embark on a career. In one way, however, his experience had been very helpful; realizing that he could not depend upon the patronage of friends and family for his advancement in life, Francis realized the inevitability of hard work to build a career for himself. He set up shop as a retail merchant offering drygoods, fabric, and wine. This new business brought him £1500 in just four months, added to his work in conveyancing – the branch of law that consists of examining titles, checking their validity, and drawing deeds, for the conveyance of property from one person to another. It was with this increase of confidence that Francis met and fell deeply in love with Miss Ann Borden of Bordentown, New Jersey. Ann was considered to be an amiable, accomplished, and beautiful girl. Ann Borden married Francis Hopkinson on September 1, 1768. The couple had five children who lived to adulthood: Joseph, Elizabeth, Mary, Ann, and Francis. Though Hopkinson was now a successful businessman and a new father, he still had the yearning for public service. During the next three and a half years, he did not give up his pursuit of a government appointment and finally, on May 1, 1772, Hopkinson was given the position of Collector of his Majesty’s Customs for the Port of New Castle, Delaware. This, added to his already growing wealth, enabled him to purchase 1060 acres of land from John Penn, in October of 1772. In 1773, Hopkinson was appointed to the New Jersey Provincial Council by Governor William Franklin. In early 1774, the family moved to Bordentown, New Jersey, Ann’s hometown. There, across the street from his father-in-law, Joseph Borden, Hopkinson built his house. 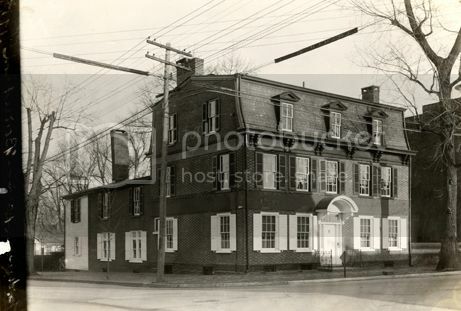 He was admitted to the New Jersey bar on May 8, 1775, and began practicing law in Bordentown. Built in 1750 on the southeast corner of Farnsworth Avenue and Park Street in Bordentown, this house became the home of Francis and Anne Borden Hopkinson from 1774 until his death. The house was originally only two stories with a gable roof. Flemish bond brick, a pent roof, and a patterned end wall were added in 1850. 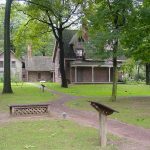 During the American Revolution, Bordentown was a hotbed of revolutionary fervor with men such as Francis Hopkinson and Thomas Paine. Patience Wright lived across the street from the Hopkinsons. Patience’s son became a friend of George Washington, painted his portrait, and designed some of the first American coins. Francis Hopkinson resigned his crown-appointed positions in 1776, and on June 21, he was chosen as one of the New Jersey delegates to the Second Continental Congress. On June 28, he took his seat; he signed the Declaration of Independence a month later. He served in the Second Continental Congress for only five months, from June to November, amd then left the Congress to serve on the Navy Board in Philadelphia. In May and June of 1778, the British pillaged and burned Bordentown. A party of Hessians suddenly invaded the Hopkinson House residence, and the family only had time to escape with their lives before the invaders began to plunder the house. The house was spared burning because of a Hessian Officer’s appreciation for Hopkinson’s library. As part of the fledgling nation’s government, Hopkinson was treasurer of the Continental Loan Office in 1778, and was appointed judge of the Admiralty Court of Pennsylvania in 1779. Hopkinson is also credited as America’s first poet-composer at a time when Philadelphia and the colonies were not well known for the arts. He wrote popular airs and political satires in the form of poems and pamphlets. Some were widely circulated, and powerfully assisted in arousing the spirit of political independence in the colonies. His song, My Days Have Been So Wondrous Free, is regarded as the earliest surviving American secular composition. Probably Hopkinson’s best-known and most popular work was The Battle of the Kegs (1778), a humorous ballad describing the alarm that was caused when the patriots of Bordentown floated kegs filled with gunpowder down the Delaware River in an attempt to blow up the British fleet anchored at Philadelphia. After the war, he served as a member of the convention at which our national Constitution was drafted. 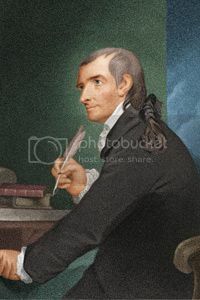 When the Constitution was put before the people in 1787, Hopkinson gave his full support, with both his voice and his pen, and helped ratify it. He also maintained a steady correspondence with Benjamin Franklin, George Washington, and Thomas Jefferson. On September 24, 1789, he was nominated by President George Washington to the newly created position of judge of the United States District Court of Pennsylvania. He was confirmed by the United States Senate, and received his commission on September 26, 1789. He served in that position until his death. This was an important and dignified position that he was well qualified and suited for, giving stability and dignity to the new national government. Francis Hopkinson died suddenly from an epileptic seizure on May 9, 1791, at Bordentown, at the age of fifty-three. 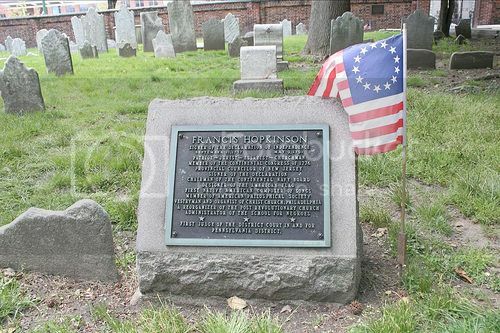 He was buried in Christ Church Burial Ground in Philadelphia. Surviving him were his widow and five children. Following the custom of the times, Ann Hopkinson made a mourning brooch to commemorate her bereavement. A lock of Hopkinson’s hair is contained on this brooch, with these engraved words: “Francis Hopkinson Departed this Life 9th of May 1791. Forgive the wish that would have kept you here.” Hopkinson House went to son Joseph Hopkinson of Philadelphia, best known as the author of Hail Columbia. Francis Hopkinson was quite versatile in his talents, being proficient in mechanics, chemistry, mathematics, music, and writing. Beloved son, adoring husband, loving father, a flawed but dependable and service-minded Christian, patriot to a young nation; truly, a Founding Father of our country. He contributed to the design of numerous important symbols and seals for the United States in the nation’s infancy. Among them are the seal of New Jersey, the Continental Board of Admiralty seal, the seal of the American Philosophical Society, theTreasury seal, and the Great Seal of the United States. The literary and artistic talents of this versatile signer brought him more acclaim than his political and legal activities. Although a lawyer and judge by profession, he achieved more eminence as an essayist, poet, artist, and musician. His verse and satirical essays rank among the better literary efforts of the Revolutionary and early Federal periods. 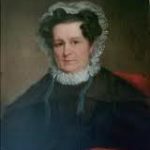 Ann Borden Hopkinson died on August 12, 1827, at Middleton, Monmouth County, New Jersey, at age 80.